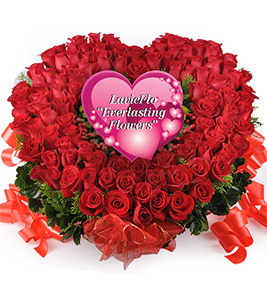 A Gift of Everlasting Beauty - 100% natural Roses that are "Preserved" using advanced technology. This year, Pods & Petals Giftlab, in collaboration with LavieFlo, is making real lasting flowers available. All the flowers and foliages used can last up to a year with proper care instruction. The preservation process replaces the blooms' sap with safe-compounds; keeping them feeling delicate and looking vibrant as fresh flowers. Almost every characteristic of a real flower is maintained, allowing its beauty to be captured for a prolonged period. Check out our Add-ons (Cuddles), Add-ons (Fashion Jewelries), Add-ons (For Him & Her), Add-Ons (Chocolates), Add-Ons (Perfume For Her), Add-Ons (Perfume For Him), Add-Ons (Balloons), Add-Ons (Chinese Tea), Add-Ons (Gourmet Food, Wines & Champagnes) and Add-Ons (Personalized Greeting Cards) to add sparkles to your gift. Unless specified otherwise, these items are only available as add-ons to your order and can't be purchased individually. Call our Customer Service at 03-78830233 should you require assistance.